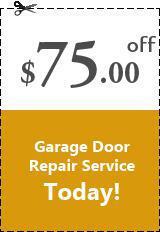 Avail $75.00 off on all kind of garage door repair service. Save $20 OFF any spring repair. Have a broken spring?? get $20 off on any spring replacement. Get a free remote control or wireless keyless entry when you purchase an $89 24 point tune-up.